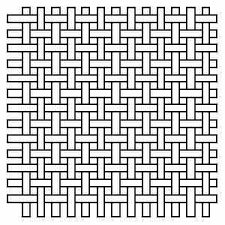 Which brings us to the interesting fact that tabby, basket and plain weave are actually all the same thing. They all have over, under repeating structures. 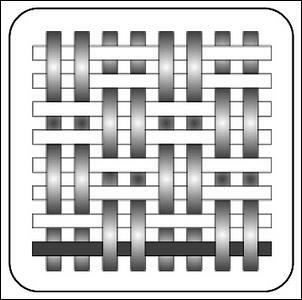 Both these diagrams show what’s called a balanced plain weave. The word “balanced” indicates that the warp and weft threads are equally spaced, but they don’t have to be. 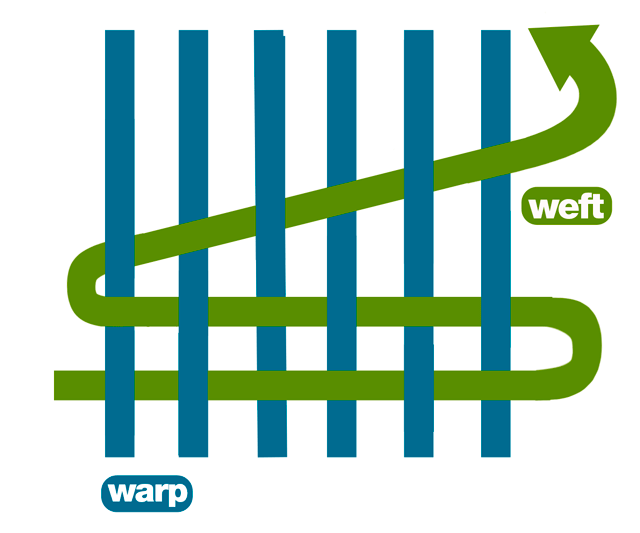 The spacing of the weft relative to the spacing of the warp, is controlled by how you beat the weft (push it into place – not as violent as it sounds!). For example, if you have a lot of space between your warp threads, and beat the weft threads so there’s very little space between them, then you get a different kind of cloth than if you beat just enough to get a balanced weave. Same applies if you have your warp threads close together, but beat the weft lightly. Playing with this to see how much it changes the way the cloth behaves is one project on my to-do list! As someone who sews, I came to weaving already knowing some basics about the structure of cloth. I knew it had selvedges (the neat edges of the cloth) and that the warp runs the length of the cloth, while the weft runs the width of the cloth between the selvedges (by-the-way that’s selvage if your from the USA). The warp threads are held in place by the loom while the weft thread travels over and under the warp threads, first in one direction and then in another. Warp and weft are at the heart of loom weaving, so it’s good to know how they “work”… And that they work the same way whether you are weaving a tapestry, a rag rug, or a fine silk cloth. Well, it’s a bunch of threads that are interlaced (passed around each other) so they can’t escape! I might be oversimplifying here, but really that’s it, and in woven cloth the threads are at right angles to each other in a sort of grid (as I talked about in my post on weaving). Another way to put it is that, the way the fabric hangs (the drape) and how it feels to touch and handle (the hand) are the result of a particular fibre (or fibres) being woven in a particular way. 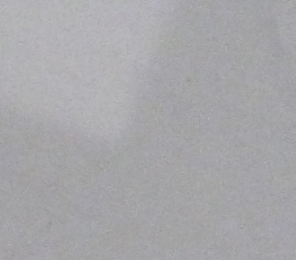 In these images you have an ordinary cotton sheet and a cotton scarf. Both are made of fine cotton thread, but one is much denser than the other. Because the scarf is less densely woven it is softer and has a lovely soft drape compared to the sheet. Why? 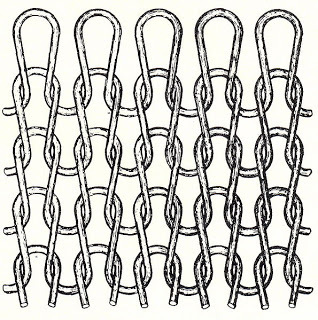 A more open weave allows the threads to move a little. 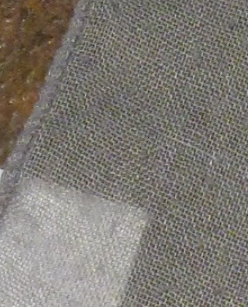 Both of these cottons have a plain weave structure (simple over, under repeating), and this is one the two most common weaving structures. The other structure is twill, which I’ll come back to another time, but it’s important to understand that each structure gives the cloth certain characteristics. Posted on July 14, 2015 July 12, 2015 Categories learner weaverTags cloth, drape, hand, weavingLeave a comment on What is cloth? …have one thing in common; they are created by passing something through/under/around something else, in a way that holds both somethings in place. It’s that last part that really matters, because if the materials don’t hold together in the weave then you have a disaster. And they hold together in the cloth because they are sandwiched between each other, though if you’ve ever cut silk or rayon fabrics you’ll know smooth threads will try to escape the moment you give them a chance! The other thing all weaving has in common is that, the end product of any type of weaving is affected by the thickness of the materials woven, how tightly woven they are and the materials used. This is as true of cloth that comes off your loom as it is of the wicker basket a basket weaver makes. 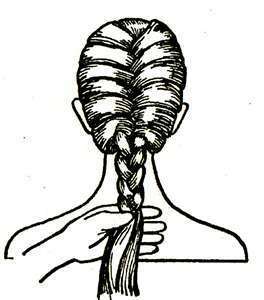 Posted on July 10, 2015 July 9, 2015 Categories understanding weavingTags chainmaille, cloth, knitting, weaving, wool, woven materialsLeave a comment on What is weaving?